At least 12 killed after shooter with 'Middle Eastern' appearance opens fire at bar in Thousand Oaks, California. At least 12 people, including a sheriff's sergeant, were killed in a shooting that took place at a bar in Thousand Oaks, California. Ventura County Sheriff's Office Sgt. Eric Buchow told CBS LA that the gunman was dead inside. CBS LA reported that deputies from the Ventura County Sheriff had responded to the incident. FBI agents, the Bureau of Alcohol, Tobacco, Firearms and Explosives, as well as the National Guard were also at the scene. The shooting took place Thursday morning (Israel time) at Borderline Bar & Grill in Thousand Oaks. According to the Bar's website, a "College Country" night was going on at the time. 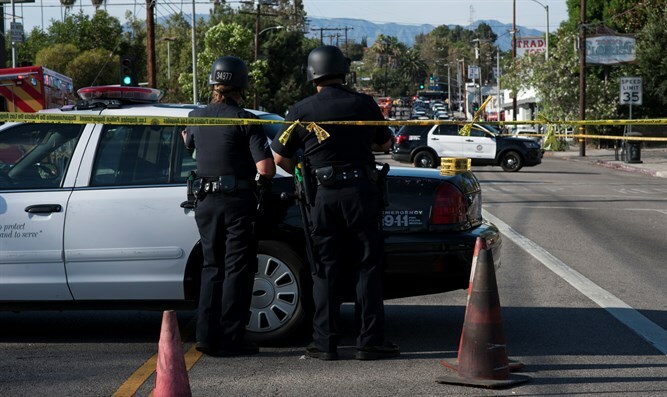 A law enforcement official told the LA Times at least 30 shots had been fired. A witness subsequently described the incident to ABC affiliate KABC. "I just started hearing these big pops. Pop, pop, pop. There was probably three or four, I hit the ground. I look up - the security guard is dead. Well, I don't want to say he was dead, but he was shot. He was down. The gunman was throwing smoke grenades all over the place. I saw him point to the back of the cash register...and he just kept firing. I ran out the front door." The witness also said that the gunman had a beard, wore a hat, had a black jacket and may have had glasses, and noted that he appeared "Middle Eastern." US President Donald Trump commented on the incident Thursday afternoon, thanking police for their bravery. "Great bravery shown by police," he wrote in a Tweet. "California Highway Patrol was on scene within 3 minutes, with first officer to enter shot numerous times. That Sheriff’s Sergeant died in the hospital. God bless all of the victims and families of the victims. Thank you to Law Enforcement."